There are several notations used for the inverse trigonometric functions. The most common convention is to name inverse trigonometric functions using an arc- prefix: arcsin(x), arccos(x), arctan(x), etc. (This convention is used throughout this article.) This notation arises from the following geometric relationships: When measuring in radians, an angle of θ radians will correspond to an arc whose length is rθ, where r is the radius of the circle. Thus, in the unit circle, "the arc whose cosine is x" is the same as "the angle whose cosine is x", because the length of the arc of the circle in radii is the same as the measurement of the angle in radians. In computer programming languages the inverse trigonometric functions are usually called by the abbreviated forms asin, acos, atan. The notations sin−1(x), cos−1(x), tan−1(x), etc., as introduced by John Herschel in 1813, are often used as well in English-language sources, and this convention complies with the notation of an inverse function. This might appear to conflict logically with the common semantics for expressions like sin2(x), which refer to numeric power rather than function composition, and therefore may result in confusion between multiplicative inverse and compositional inverse. 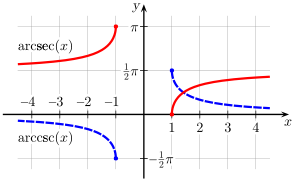 The confusion is somewhat ameliorated by the fact that each of the reciprocal trigonometric functions has its own name—for example, (cos(x))−1 = sec(x). Nevertheless, certain authors advise against using it for its ambiguity. Another convention used by a few authors is to use a majuscule (capital/upper-case) first letter along with a −1 superscript: Sin−1(x), Cos−1(x), Tan−1(x), etc. This potentially avoids confusion with the multiplicative inverse, which should be represented by sin−1(x), cos−1(x), etc. Since 2009, the ISO 80000-2 standard has specified solely the "arc" prefix for the inverse functions. Since none of the six trigonometric functions are one-to-one, they are restricted in order to have inverse functions. Therefore the ranges of the inverse functions are proper subsets of the domains of the original functions. For example, using function in the sense of multivalued functions, just as the square root function y = √x could be defined from y2 = x, the function y = arcsin(x) is defined so that sin(y) = x. For a given real number x, with −1 ≤ x ≤ 1, there are multiple (in fact, countably infinitely many) numbers y such that sin(y) = x; for example, sin(0) = 0, but also sin(π) = 0, sin(2π) = 0, etc. When only one value is desired, the function may be restricted to its principal branch. With this restriction, for each x in the domain the expression arcsin(x) will evaluate only to a single value, called its principal value. These properties apply to all the inverse trigonometric functions. If x is allowed to be a complex number, then the range of y applies only to its real part. Trigonometric functions of inverse trigonometric functions are tabulated below. A quick way to derive them is by considering the geometry of a right-angled triangle, with one side of length 1, and another side of length x (any real number between 0 and 1), then applying the Pythagorean theorem and definitions of the trigonometric ratios. Purely algebraic derivations are longer. 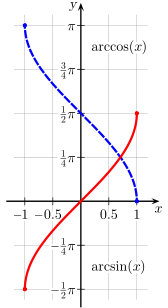 The usual principal values of the arcsin(x) (red) and arccos(x) (blue) functions graphed on the cartesian plane. 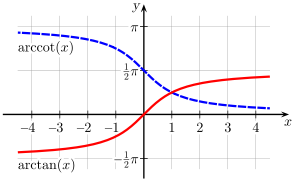 The usual principal values of the arctan(x) and arccot(x) functions graphed on the cartesian plane. Principal values of the arcsec(x) and arccsc(x) functions graphed on the cartesian plane. Whenever the square root of a complex number is used here, we choose the root with the positive real part (or positive imaginary part if the square was negative real). When x equals 1, the integrals with limited domains are improper integrals, but still well-defined. in a geometric series and applying the integral definition above (see Leibniz series). The second of these is valid in the cut complex plane. There are two cuts, from −i to the point at infinity, going down the imaginary axis, and from i to the point at infinity, going up the same axis. It works best for real numbers running from −1 to 1. The partial denominators are the odd natural numbers, and the partial numerators (after the first) are just (nz)2, with each perfect square appearing once. The first was developed by Leonhard Euler; the second by Carl Friedrich Gauss utilizing the Gaussian hypergeometric series. The absolute value in the argument of the arcosh function creates a negative half of its graph, making it identical to the signum logarithmic function shown above. All of these antiderivatives can be derived using integration by parts and the simple derivative forms shown above. 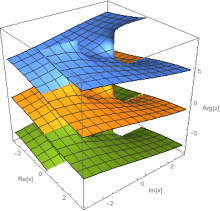 A Riemann surface for the argument of the Tan[z]=x function in the complex plane of x. The orange sheet in the middle is the principal sheet representing ArcTan(x). The blue sheet above and green sheet below are displaced by 2 π and -2 π respectively. where the part of the imaginary axis which does not lie strictly between the branch points (−i and +i) is the branch cut between the principal sheet and other sheets. The path of the integral must not cross a branch cut. For z not on a branch cut, a straight line path from 0 to z is such a path. For z on a branch cut, the path must approach from Re[x]>0 for the upper branch cut and from Re[x]<0 for the lower branch cut. which has the same cut as arcsec. These functions may also be expressed using complex logarithms. This extends their domains to the complex plane in a natural fashion. Elementary proofs of these relations proceed via expansion to exponential forms of the trigonometric functions. Each of the trigonometric functions is periodic in the real part of its argument, running through all its values twice in each interval of 2π. Sine and cosecant begin their period at 2πk − π/2 (where k is an integer), finish it at 2πk + π/2, and then reverse themselves over 2πk + π/2 to 2πk + 3π/2. Cosine and secant begin their period at 2πk, finish it at 2πk + π, and then reverse themselves over 2πk + π to 2πk + 2π. Tangent begins its period at 2πk − π/2, finishes it at 2πk + π/2, and then repeats it (forward) over 2πk + π/2 to 2πk + 3π/2. Cotangent begins its period at 2πk, finishes it at 2πk + π, and then repeats it (forward) over 2πk + π to 2πk + 2π. is the length of the hypotenuse. Arctangent comes in handy in this situation, as the length of the hypotenuse is not needed. The two-argument atan2 function computes the arctangent of y / x given y and x, but with a range of (−π, π]. In other words, atan2(y, x) is the angle between the positive x-axis of a plane and the point (x, y) on it, with positive sign for counter-clockwise angles (upper half-plane, y > 0), and negative sign for clockwise angles (lower half-plane, y < 0). It was first introduced in many computer programming languages, but it is now also common in other fields of science and engineering. It also equals the principal value of the argument of the complex number x + iy. provided that either x > 0 or y ≠ 0. However this fails if given x ≤ 0 and y = 0 so the expression is unsuitable for computational use. The above argument order (y, x) seems to be the most common, and in particular is used in ISO standards such as the C programming language, but a few authors may use the opposite convention (x, y) so some caution is warranted. These variations are detailed at atan2. For angles near 0 and π, arccosine is ill-conditioned and will thus calculate the angle with reduced accuracy in a computer implementation (due to the limited number of digits). 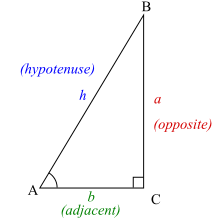 Similarly, arcsine is inaccurate for angles near −π/2 and π/2. ^ Taczanowski, Stefan (1978-10-01). "On the optimization of some geometric parameters in 14 MeV neutron activation analysis". Nuclear Instruments and Methods. ScienceDirect. 155 (3): 543–546. doi:10.1016/0029-554X(78)90541-4. Retrieved 2017-07-26. ^ Hazewinkel, Michiel (1994) . Encyclopaedia of Mathematics (unabridged reprint ed.). Kluwer Academic Publishers / Springer Science & Business Media. ISBN 978-155608010-4. ^ Mejlbro, Leif (2010-11-11). Stability, Riemann Surfaces, Conformal Mappings - Complex Functions Theory (PDF) (1 ed.). Ventus Publishing ApS / Bookboon. ISBN 978-87-7681-702-2. Archived (PDF) from the original on 2017-07-26. Retrieved 2017-07-26. ^ Durán, Mario (2012). Mathematical methods for wave propagation in science and engineering. 1: Fundamentals (1 ed.). Ediciones UC. p. 88. ISBN 978-956141314-6. ^ Klein, Christian Felix (2004) . Elementary Mathematics from an Advanced Standpoint: Arithmetic, Algebra, Analysis. Translated by Hedrick, E. R.; Noble, C. A. (Translation of 3rd German ed.). Dover Publications, Inc. / The Macmillan Company. ISBN 978-0-48643480-3. Retrieved 2017-08-13. ^ Dörrie, Heinrich (1965). Triumph der Mathematik. Translated by Antin, David. Dover Publications. p. 69. ISBN 978-0-486-61348-2. ^ Beach, Frederick Converse; Rines, George Edwin, eds. (1912). "Inverse trigonometric functions". The Americana: a universal reference library. 21. ^ Cajori, Florian (1919). A History of Mathematics (2 ed.). New York, NY: The Macmillan Company. p. 272. ^ Herschel, John Frederick William (1813). "On a remarkable Application of Cotes's Theorem". Philosophical Transactions. Royal Society, London. 103 (1): 8. doi:10.1098/rstl.1813.0005. ^ Korn, Grandino Arthur; Korn, Theresa M. (2000) . "21.2.-4. Inverse Trigonometric Functions". Mathematical handbook for scientists and engineers: Definitions, theorems, and formulars for reference and review (3 ed.). Mineola, New York, USA: Dover Publications, Inc. p. 811. ISBN 978-0-486-41147-7. ^ Bhatti, Sanaullah; Nawab-ud-Din; Ahmed, Bashir; Yousuf, S. M.; Taheem, Allah Bukhsh (1999). "Differentiation of Trigonometric, Logarithmic and Exponential Functions". In Ellahi, Mohammad Maqbool; Dar, Karamat Hussain; Hussain, Faheem (eds.). Calculus and Analytic Geometry (1 ed.). Lahore: Punjab Textbook Board. p. 140. ^ Borwein, Jonathan; Bailey, David; Gingersohn, Roland (2004). Experimentation in Mathematics: Computational Paths to Discovery (1 ed.). Wellesley, MA, USA: :A. K. Peters. p. 51. ISBN 978-1-56881-136-9. Weisstein, Eric W. "Inverse Trigonometric Functions". MathWorld. Weisstein, Eric W. "Inverse Tangent". MathWorld.